It’s all about potatoes, potatoes, potatoes! I went back to the discount store where Rob discovered potatoes for 10c/lb last week, and bought 100 additional pounds for $10. I gave away 20 lbs right off the bat, and started cooking potatoes. While I was at the store buying the potatoes, rejoicing because there were still some left, I bought my daughter $1.29 worth of snacks. And, that was it for the week–$11.29. That brings the total up to $61.29 for a 3-week total, leaving $138.71 from the $200 I set out in envelopes. What did we eat? I’m glad you asked. Refrigerator items and produce left over from last Friday or before that I used: cheese, milk, eggs, lunchmeat, sour cream, carrots, celery, lettuce, tiny bit of broccoli, cauliflower, tomatoes, 1/2 and 1/2, butter, onions, POTATOES! Garden: Chives! I only got enough to sprinkle on the soup, but it’s a start! 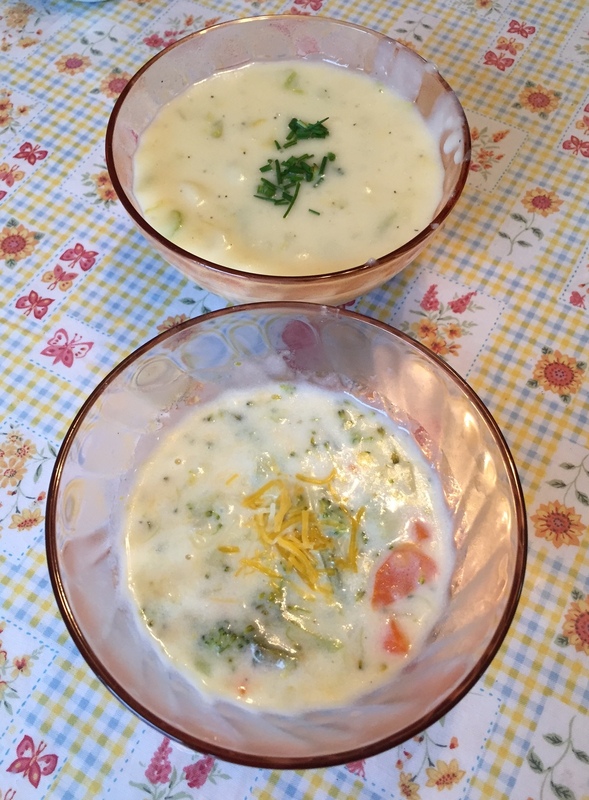 The girls made large batches of cheddar-broccoli soup and potato-cheddar soup. We had that several times, including today for lunch. My sister took a bunch for her lunch one day when she got to my house to drop Alissa, and realized that she had left hers on the counter at her house. Rob also took some in his lunch, and my mom enjoyed it, too, when she came over for lunch one day. They are getting some serious cooking skills! 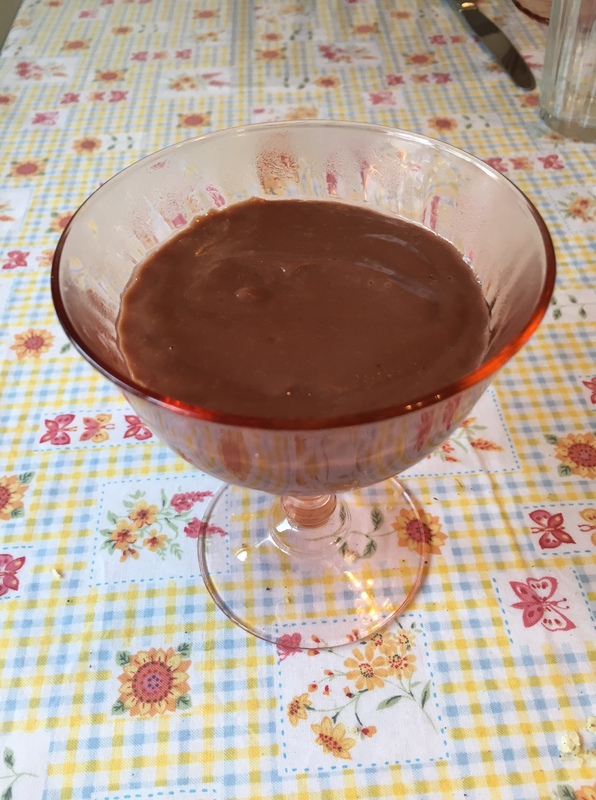 They also made a simple cornstarch chocolate pudding from my “More With Less Cookbook.” It was great. I found a container of frozen turkey-spaghetti sauce in the shop freezer that was a couple of years old. I wasn’t sure if it was still good, but it was excellent and we ate spaghetti one night with green beans. I made an enchilada casserole from–wait for it–tortillas, beans, sauce, cheese. We ate it for dinner tonight. I cooked a chicken Saturday night. I have to admit it tasted really, really good after so many tacos. I boiled the bones and have some broth to use this week. I made mashed potatoes and gravy and green beans with it. Rob made chicken-potato pancakes from: 1 cup cut up chicken, 2 cups leftover mashed potatoes, 3 eggs, a few tablespoons of chopped onion, salt and pepper. He then fried them in a pan. They were amazingly good for supper last night. I made salad from leftover taco lettuce and tomato, and put salsa over the top, along with leftover green beans. Rob also ate leftover corn. So, the meals ended up being quite repetitious this week. Still, we enjoy Mexican food a lot, and we love potatoes. The chicken made a nice change. I feel really good about how the week went. I will be buying a few more fresh things this week than last. The lettuce is almost gone as are a few other things. But, the challenge was helped along a bit when my sister gave me an avocado, some veggie chips she got for really cheap at Grocery Outlet, and 1/2 of the stir-fry veggies she bought today. I enjoyed stir-fry for dinner tonight and she enjoyed the other 1/2 for her dinner. My other sister gave us some crackers and another bag of snacks. My aunt and sister did the cooking for this Sunday’s family dinner and gave me the week off. I guess none of them want anyone to really suffer through this challenge!! As I stated in the rules in the beginning, I have another account where I occasionally buy some fast food for one kid or another. It’s my “keep from going crazy and keeping balance in my life on crazy days” account. That was my day on Thursday. I was hit with several unexpected things that I needed to do and I ended up driving around a lot, doing school in-between driving around so it went late into the day, taking care of a sick kid, and more. I was simply not home at lunch time with no time to plan ahead for it, and yet, had a car full of hungry kids. Guess where mine wanted to go? Seriously, just guess. Yep. Taco Bell. Ja’Ana chose Taco Bell. Where she bought…..yep…..burritos and other items containing tortillas, beans, rice, etc.–one of those $5 boxes. It surprised me a bit. I limited each one to $5 and they were fine with that. Michaela and I chose Dairy Queen. Later, when Alissa was picked up, she also chose Taco Bell, which did not surprise me since she doesn’t eat dinner here. There is lots and lots of food still left around here. I’m not sure what I’m going to cook this week, except for something from the broth. And potatoes. I’ll let you know as it unfolds. How is it going for you? The chicken potato pancakes sound great. I’ve never tried that kind of combination. Well see how good a job I can do. We’ve never had that, either. Rob just made it up on the spot. It was really, really good. Wow. You had an amazing week. I cooked all meals at home. We finished up our chicken soup. I cooked a pork roast from the freezer and thawed out some split pea soup. We’ve had a couple of the kielbasa sausages I bought last week. I went to cash and carry today for milk and 50# of Yukon gold potatoes. If we don’t eat them all before they get wilty I will plant them in the garden for new potatoes all summer. My case of red bell peppers got processed for the freezer as well as the sausages. We’ve had hash browns and eggs most mornings. Salads and sandwiches otherwise besides fried rice and the pork roast. My hens are laying 6 to 8 eggs a day so there are plenty to use with 2 dozen a week to share. My budget for the month is also 200.00. To date march expenditures are at 74.15. Most of that was stock up items at excellent prices that filled up all the space I had gained in the freezer. It sounds like it’s going great for you, also. I love being stocked up. It’s a great feeling. Yes, I was glad to see that chive bush last fall when we moved in. I plan to plant a few more herbs near the chive bush this spring. When Ja’Ana leaves home she’ll be able to keep a very small grocery budget with her love of beans and Mexican food! I think my family would be happy to eat potatoes every day. And I wouldn’t mind the beans! Great going on your challenge! Thanks! I just had to laugh over that one, though. That was a great gift–all those potatoes! We don’t get tired of them, either. A friend of ours grew up in Idaho. His Dad got a job hauling potatoes one year and the load he had was rejected at the processing plant who does the FF for McDonalds. He came home with a truck load of potatoes, I mean semi truck, He asked our friends Mom what she thought he should do with the potatoes and she was not really paying attention. She said, Oh, dump them on the garden. It was like a half acre of potatoes piled a couple feet deep! 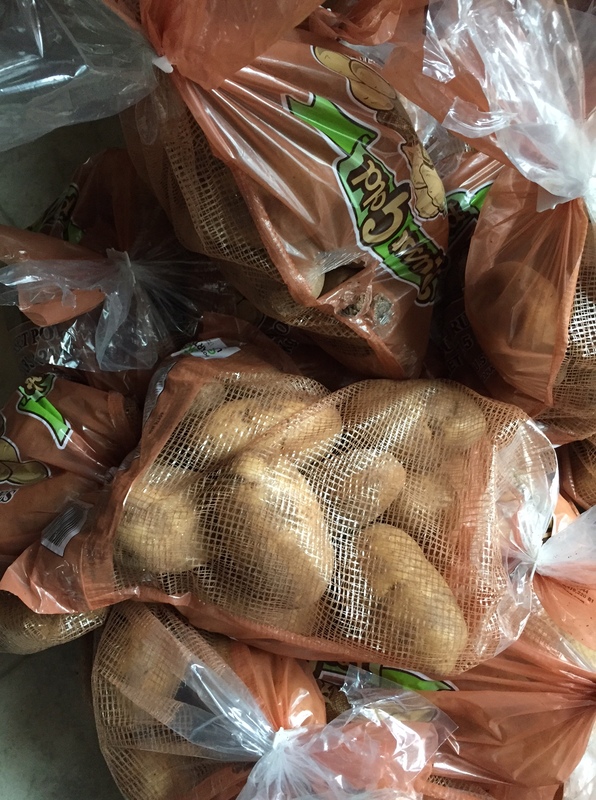 They ate potatoes, they gave potatoes away by the pick up load to friends. Our friend and his brothers bagged them and sold them along the highway for $1 for 50 pounds. He said they never wanted to see another potato for a long time after that! That’s too funny! I’m glad someone could benefit, because that’s a little too much compost for one garden. I’m sure that family was tired of potatoes for more than one reason–that sounds like a lot of work just to get them moved out. I’ll bet the following spring they had a lot of volunteer potato plants in their garden. YOu never cease to amaze and impress me Becky! Thank you. Those are very kind words! That is so awesome–you raised your own beef! We never did that, although we raised turkeys, chickens and pork. I should say Rob raised them–there was really no “we” about it:) I have been buying 1/2 beef each fall, but realize that we are not longer needing quite that much, so will switch to 1/4 next fall. I LOVE having bulk meat in the freezer. It takes the stress out of meal planning, for sure. You are right–I can’t wait for gardening and canning season! you can make with them. ps— I just bet you could add the taco seasoned hamburger to the potato patties, for a taco patty.????? Bacon sounds great! Say, I left 4 comments on your blog the other day, and every one failed, for whatever reason, as far as I can tell. So, I just want to say that your dresses for your granddaughters are lovely, and I love the way they accessorized them! I have heaps of potatoes that need using up. You’ve inspired me to do something Mexican. That’s great! We ate potatoes tonight again, and finished up the mashed ones from the other day. Now, it’s back to the potato drawing board:) In fact, we ate up most of the leftovers from the fridge tonight–I guess everyone was hungry from exercising at the YMCA. I love it when the fridge empties out because people ate it up! I don’t know if you like eggplant but I’m thinking of making Kenyan eggplant and potato curry this week. Have potato pumpkin and lentil curry (Malaysian I think) in freezer. I haven’t used much eggplant, ever. It’s something that I have had very little success growing in my garden, and I usually eat what I can grow. Those curry dishes sound wonderful. I do like curry. Becky: I love reading your posts. Your humorous way of describing your family’s weekly food/budget struggles is fun to read as well as very inspiring. I am not as adaptable as you are (yet), but I am learning much from your ways. 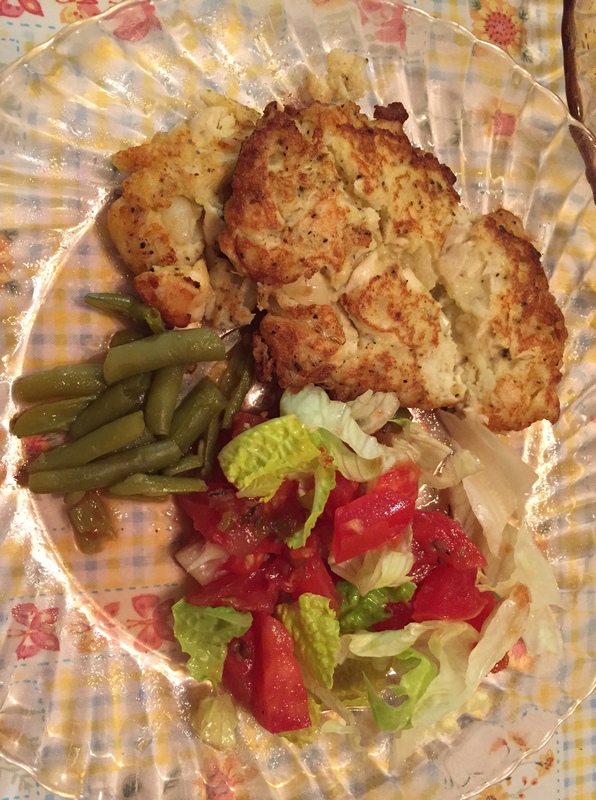 I plan to try Rob’s chicken-potato pancakes this week. What a great way to use leftovers ! Thank you. I’m glad you are going to try the potato pancakes, because I loved them. Hopefully, they will turn out as good for you. He put a little oil in the pan when he fried them so they crisped up well on the edges and didn’t stick. This series is just so inspiring to me. Love your writing as well as all the comments it’s getting. So my goals this week are to make at least one meal from the freezer and one meal from mostly pantry items. Of course, I didn’t do either last night as I had breakfast for dinner. Although I did use hash browns from the freezer so maybe that will be my ‘freezer’ meal this week. hahaha! My goto potato dish is Au Gratin potatoes. It always was a hit. Recipe from Betty Crocker’s old style red & black cookbook. Just in case you’re looking for ideas. And, I so miss Taco Bell. We don’t have that chain here in my part of Canada. Taco Bell and cheap tacos from Jack in the Box got me through grad school. I’m glad you are enjoying the series. It sounds like a freezer meal and a pantry meal is a great goal! I’m not sure what my crew would do without Taco Bell:) –Oh, wait–yes I do–they would have me make it every other day:) I think I have that old cook book somewhere around here–good to know. with mashed potatoes. Either way, yum! I’ve never actually eaten potatoes with Mexican food, except for one time when a Mexican lady I know made tamales and some of them had potatoes in the filling. Those were great, so I’ll bet cubed potatoes in tacos would be good. Good idea! Your weekly meal plan looks delicious. Potatoes, beans and chocolate. I like the idea of the “keep from going crazy acct” Somedays, I just need an easy route but never thought to budget for that. Thanks for the idea. Jenifer, we used to just do things like grab a burger, and then feel guilty. Now, I don’t have to feel guilty, but also keep it under control. It’s really easy to slip into a bad habit around here. Yesterday, for example, I ended up driving and driving with kids again, but I did have enough warning to tell them to eat first. One did not. She bellyached a lot, but survived until she got to a place where she could get a snack from existing supplies. I did tell her she would be welcome to put a “stash” into the car for another time. Thank you. It was fun to challenge myself.